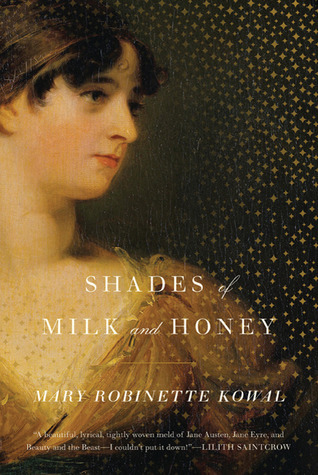 Shades of Milk and Honey keeps being described as "Jane Austen with magic" and the shoe fits. Young ladies, in addition to painting, singing, and playing the piano, learn "glamour" -- a magic that bends folds out of the ether. Glamour is largely used to enhance paintings and décor. Maintaining a glamour that moves around the room requires the extended focus of the glamourist, an exhausting and potentially deadly proposition. Our heroine, Jane Ellsworth, is twenty-eight, plain and single. Her only rational hope for the future is that her beautiful younger sister Melody will marry well and hire her as the governess for her future children. Despite the pain of her situation, Jane refuses to whine, pine, or wallow, but practices her glamour and cares for her family. Then eligible bachelors reach the scene -- a captain, a respectable neighbor, a glamour artist -- and, of course, they all hide secrets. This book was simply delightful. I felt like I should go enjoy some crumpets afterwards. The prose is easy to follow, with touches of wry humor. The plot never lulls; Mary Robinette Kowal is an expert at dropping one detail at a time, pulling me along because I need to know the next revelation, the next twist, that subtly alters what's happening. It's also resplendent with Victorian charm. When I finished, I handed it to my husband. He went into reading coma and resurfaced to the living world three hours later, book read. It's that kind of magical story. There are no wars, no kingdoms at stake, and I still couldn't put it down. I blame Jane. With such a stalwart, loveable character at the core of this drama, I couldn't rest until I'd finished the last page. Thank you for that lovely, lovely review. I love Jane Austen, so this book seems to be right up my alley. Thanks for the review! This novel sounds like the most perfect fit ever for me! I just ordered it. Thanks for the great review! When I wrote the review, I wasn't aware, but there's also a sequel coming out in April -- Glamour in Glass. Gorgeous cover. I'm rather excited to read it.